Place the butter and half the sugar into a large bowl and beat together until light and fluffy then beat in the egg yolk and vanilla extract. Sift together the flour, cocoa and salt into the mixture and stir until combined. If the dough feels too sticky, work a little more flour into it until it doesn’t stick to your hands. Halve the dough, shape into balls and wrap in clingfilm. Put in the fridge for 30-60 minutes. Preheat the oven to 180°C/350°F/Gas 4. Line 2 large baking sheets with baking paper. Unwrap the dough and roll out between 2 sheets of baking paper. Cut out the cookies using a heart-shaped cookie cutter and place them on the baking sheet, placed well apart. Bake in the preheated oven for 10-15 minutes, or until firm. Leave to cool on the baking sheet for 5-10 minutes then transfer to a wire rack to cool completely. While the cookies are cooling, divide the remaining sugar among four small plastic bags or bowls. Add some food colouring paste to each and rub in well until mixed. Wear a plastic glove if mixing in bowls to protect your hands from getting stained. Place the chocolate in a heatproof bowl, set the bowl over a saucepan of gently simmering water and heat until melted. Leave to cool slightly. Leave the cookies on the racks. 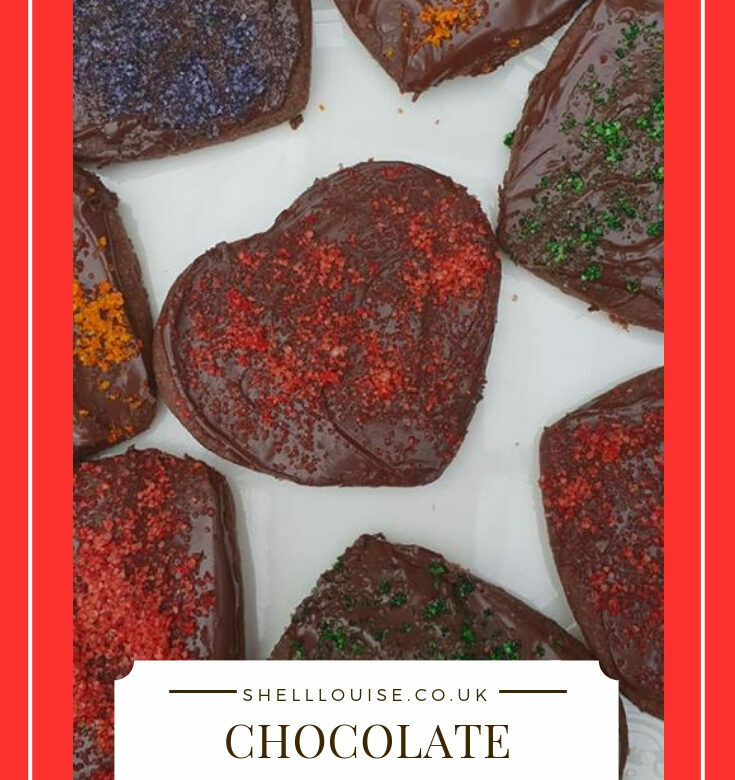 Spread the melted chocolate over them and sprinkle with the coloured sugar.